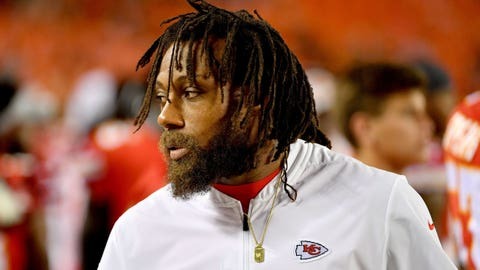 Eric Berry may yet be able to play this season. KANSAS CITY, Mo. — Andy Reid didn’t even need someone to ask the question before he supplied the answer to what every Chiefs fan in Kansas City had been wondering throughout their bye week. “I really don’t have any news on Eric Berry,” he said. Cue the sound of a deflating balloon. Still, there have been signs the Chiefs’ highly paid star safety could return to practice this week for the first time since early in training camp. Reid has said nothing more than Berry is getting better every day, but he has been more visible around the team than he had been the past few months. The timing of his return this week also would make sense. The Chiefs had a week off following their shootout loss to the Rams in Los Angeles, giving not only Berry an extra week to get healthy, but the rest of the team, too. And with the Raiders up next on Sunday, the Chiefs probably don’t need Berry to get back on the field right away. That means he would have two weeks of practice — at minimum — to shake off the rust and return to the field, then four regular-season games and the playoffs to make an impact this season. The issue appears to be with Berry’s heel, close to where he tore his Achilles tendon in last season’s opener. But neither the Chiefs nor Berry have been willing to discuss it in detail. Maybe not for Reid, but there certainly is an expectation for Chiefs fans. They watched the Chiefs (9-2) lose their only two games in nip-and-tuck road shootouts to the Patriots and Rams, and it’s hard to believe a healthy Berry would not have made a difference. While the Chiefs’ beleaguered cornerbacks have actually fared quite well this season, at least when advanced metrics are considered, their safety situation has been a major downfall. It hasn’t helped that Daniel Sorensen has been back only a couple of weeks after breaking his leg in training camp, or that rookie Armani Watts landed on injured reserve as he was finding his stride. Throw in Berry and that’s three starting-caliber safeties who have been missing. Reid didn’t have much other injury news Monday, pointing out that players were still trickling in from a lengthy break. A snowstorm that blitzed through Kansas City on Sunday may have caused a few players to be delayed, but Reid said everyone would be present for meetings and practice. He did say that wide receiver Sammy Watkins, who has been dealing with a troublesome foot injury, remained in Kansas City last week to get treatment. Reid said Watkins’ foot is “still tender,” and it’s unclear whether Watkins will be available this week against Oakland. Just about everybody else should be ready to go.